When I was a boy, growing up in the midst fo the Cold War, the sight of a fallout shelter sign was very common. These were the familiar yellow and black signs that seemed to be posted everywhere. Most commercial buildings and many apartment buildings had them. Such a sign indicated the the building on which it was posted had a civilian fallout shelter, usually in the basement. These were to be used as guides in case of emergency. The shelters were the most visible of the vast American Civil Defense program. 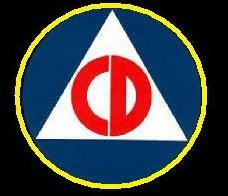 The American Civilian Defense program (CD), was a huge undertaking. It presumed to be able to shield a population that at the time numbered around 250 million people. It sought to protect this huge population from a sudden attack from which there might only be 20 minutes warning. It also sought to preserve enough of American civilization, culture, and productivity to be able to restore the survivors to a functional level after emergence from the shelters. It was an amazing program that sought to anticipate and provide for everything the large civilian population would need while sheltered from the worst effects of nuclear war. So shelters were set up and stocked with everything from crackers, and hard candy, to Geiger counters and shortwave radios. Freeway underpasses were set up as makeshift shelters, special Conelrad radio stations were set up in case of emergency, and we were drilled in school about what to do in case of attack. Manuals, guidebooks, and various other publications were available for those who wished to build and stock their own home shelters. Among the blankets, chemical toilets, bicycle powered ventilators, and gas masks that were being stockpiled and delivered to shelters all over the country, the most fascinating and desirable objects were the radiation detection kits. These were all painted in the familiar CD yellow, and were stocked in the larger public shelters. Most of the other things you might find in a shelter were vital but common. A radiation detector was special. Outside of the Civil Defense program, American citizens were encouraged to build bomb shelters, fallout shelters, and to store food and survival gear in basements and other safe places. Civil defense guides were (and still are) widely available. The chart to the left shows the effects you can expect with various doses of radiation on various time scales. A REM is approximately equal to a RAD, which is close to a Roentgen. While there are differences between the types of measurements, for the purposes of what these meters can read, they are the same. Below the dose chart, I have put together a conversion table for the various units used. This table will mostly be useless, and is accurate for pure gamma ray exposure only, which is why I advise that for all practical purposes the units are the same. The REM, and the related unit, the Sievert are the most accurate units, but can not be determined by the old CD gear, because such gear can only measure gamma rays, and sometimes detect beta particles. The REM and the Sievert are measurements of risk, while the RAD and the Gray are measurements of exposure. A REM is the same as a RAD, except that it has a factor for the type of particle. Unfortunately none fo these radiation detectors can detect the difference between the neutron, proton, alpha and beta particles, or gamma rays. The good news is that protons, beta particles, and alpha particles will rarely be a danger. These are also easily stopped. Neutrons are still an issue and are very penetrating; but neutrons have a very short half life (around 10 minutes), so they disappear quickly and are not a danger for any length of time. The table below uses generic values for the (D)dose and (R)risk weighted measurements. It assumes that all radiation is gamma radiation (the only kind that CD radiation detectors can detect), and that they all strike soft tissue. As can be seen the RAD, and the Roentgen are virtually the same. The Sievert and the REM differ from the RAD and the Gray, only when dealing with radiation other than gamma rays or X-rays. The conversion factors are given below, but are moot when using CD radiation detectors, since these do not detect neutrons, alpha particles, or protons. Is the old CD gear worth buying? The answer is that it depends upon the gear. For a high level radiation meter, the CDV-715 can not be beat, simply because nothing like it is available new, at anything like a reasonable cost. For lower level meters, like the CDV-700 Geiger counter, This depends upon your needs. Low level radiation meters - Geiger counters, are available from a number of different sources, and can cost as little as $200 (even less in kit form). For this you will get a more modern piece of equipment, guaranteed accurate, and with some features (computer interface, digital readout, replaceable probes), not included on the old CDV-700. What you lose on buying a new unit, is the amazing durability, quality of build, and reparability of the older units. You also lose the satisfaction of having a collectable piece of history. In addition, with so many of these units around, an aftermarket has grown up to provide many of these features as add-ons. 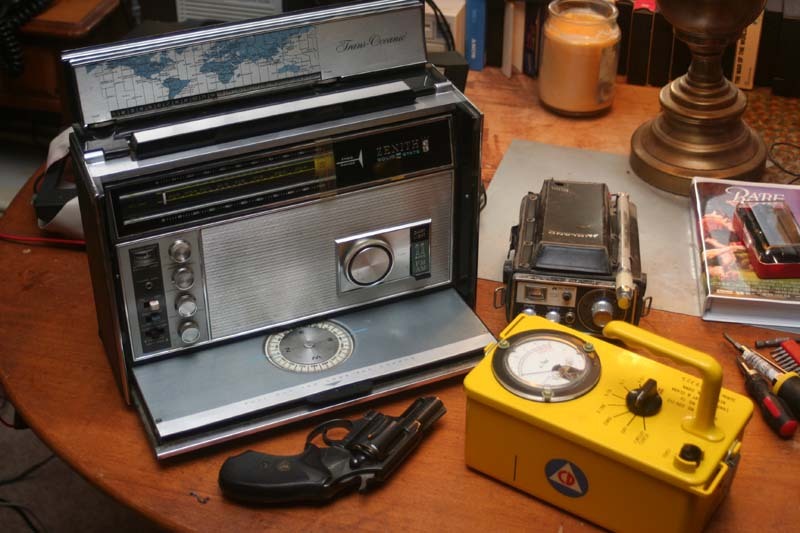 As far as having a Geiger counter to play around with, if you do not require top performance, and just want something to wave at various things to see if they are radioactive, getting an old CDV-700 for $150 or so might be just the thing. On the other hand, if you want to do serious work, or think that one day your life may depend upon this gadget, then a fully calibrated and checked CDV-700 is around $450, and a good quality new unit will set you back anywhere from $250 - $1700. Dosimeters are available in huge quantities right now, and cost around $7 - $10 each. A charger will be required to set them back to zero; but these are also quite inexpensive, in the neighborhood of $15 - $25. Modern counterparts are not available at anything near this price. Film badges, or film cards, can be picked up for around $5 each; but obviously can not be recharged. Dosimeters which have been calibrated and refurbished are going for around $25 right now. In regards to dosimeters, please be aware there is a variety of crooks and jerks out there selling RF detectors for anywhere from $10 - $15 or more, and marketing them as dosimeters. Look carefully at what you are buying. These meters are being misrepresented. They measure radio energy, and are nothing more than glorified radio field strength meters. CDV-715 $25 - $50 $100 $350 Yes no no ? CDV-700 $150 - $200 $100 $450 yes yes no ? Charger and 4 dosimeters $50 - $100 $100 ($25 ea) $250 yes no no ?